Have you ever wondered what happens to the money that we raise by showing movies and giving tours in the Cemetery? Now that the money needed to restore the fence is secured, we’ve moved on to see what can be done to preserve the markers. From June 13 until June 20, 2018, members of the Northern Bedrock Historic Preservation Corps have been in the Cemetery cleaning, straightening, unearthing, and resetting markers. At the end of only three and a-half days they had already completed work on 80 markers and they still had two and-a-half days to go. And they did much of their work in 90-plus degree temperatures. The staff is five members of an AmeriCorps crew who have received training in restoring historic properties. 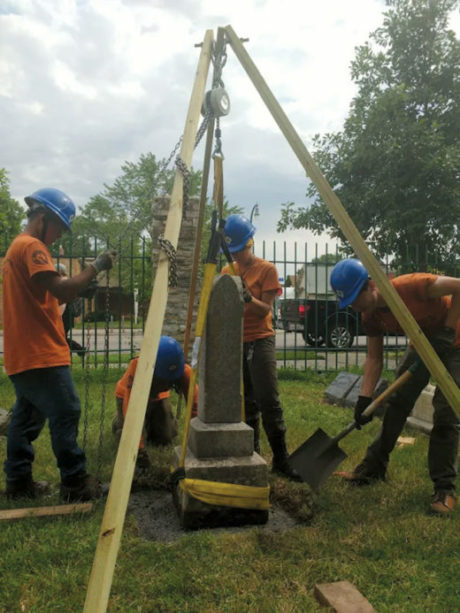 Their work is funded through the State’s Legacy program, and Friends of the Cemetery is picking up the cost of the materials and cleaning supplies. How important are these markers? 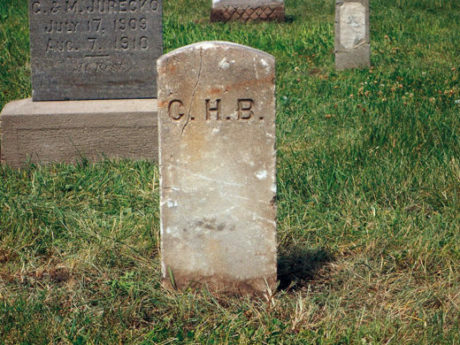 Cemetery markers serve as gateways to stories about people’s lives. 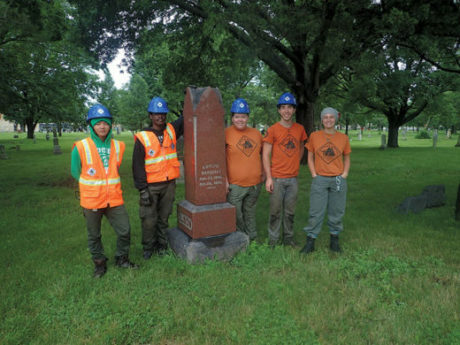 The section of the Cemetery where the crew started working is Section j-1, the stretch that runs from approximately 20th Avenue to Cedar along Lake Street. There are 814 people buried in that section but probably no more than 80-100 of them have markers. The majority of burials in j-1 date from between 1900 and 1910. One of the first things that crew members noticed is that the majority of the burials are children and infants (82% are babies and children under the age of 10). That percentage is considerably higher than the Cemetery’s average but we know that overall at least half of the 22,000 burials are children. The children died from a variety of causes but a large number of their deaths were related to childbirth: 96 were stillborn and 79 died as a result of being born prematurely. Most of their graves are not marked but those that are serve as reminders that these children were not numbers—they were “darling” daughters and “beloved” sons, words that were often obscured by lichen and dirt. The adults are an interesting mix. There are three soldiers (one from the Civil War and two from the Spanish-American War) who can be easily identified by the style of their markers. Two people were murder victims, one grave is marked but the other is not. The most common cause of death for adults was tuberculosis but if you pay close attention you might notice a number of deaths that occurred around the same time suggesting that there might have been an epidemic, something like smallpox, diphtheria or typhoid. You’ll see several inscriptions that are written in languages other than English. 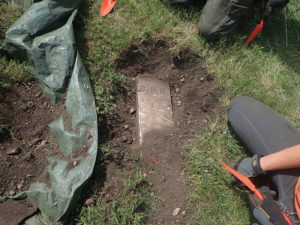 At least 76 of the 129 adults buried in j-1 were immigrants; the majority came from Norway and Sweden but they came from seven other countries, as well. Although this is a nondenominational (secular) Cemetery, you will see symbols of religious belief. You will see relationships: Father, Mother, Sister, Brother, Son and Daughter. …and reset upright to keep memories above ground! You can tell a lot by looking at a stone and you can use those details to imagine the rest of the story. Where did this person come from and why? What caused a 24-year-old man or woman to die so young? Who did they leave behind? Maintaining the markers is an act of respect and remembrance and for that we are grateful to the staff and supporters of Northern Bedrock. And a very special thank you to an outstanding crew: Haven Epstein, Addison Galagan, Sarah Insalaco, Daquan Johnson, and MahooYa for outstanding work. Five AmeriCorps, Northern Bedrock Historic Preservation Corps workers reset and cleaned 150 markers at Pioneers and Soldiers Memorial Cemetery utilizing their historic restoration training and using MN Legacy Funds. Friends of the Cemetery paid for supplies with proceeds of Cemetery Cinema and Tours like Buster Keaton’s movie, “The General,” on May 25th – audience and “Peanuts, Popcorn, and Preemies” Tour for 40 people on June 10th, respectively.